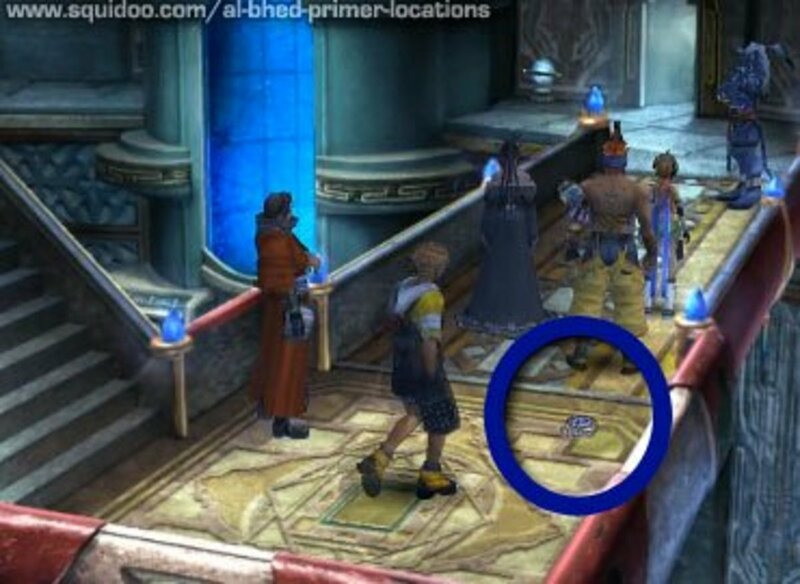 This Final Fantasy X Secrets guide will help you in your scavenger hunt to find all the Al Bhed Primers scattered across Spira. And by the way, contrary to what you may have read elsewhere, there IS a way to get the Al Bhed Primers you missed in Home and Bevelle -- I've tested it, and it works! See the Al Bhed Compilation Spheres Tip below! 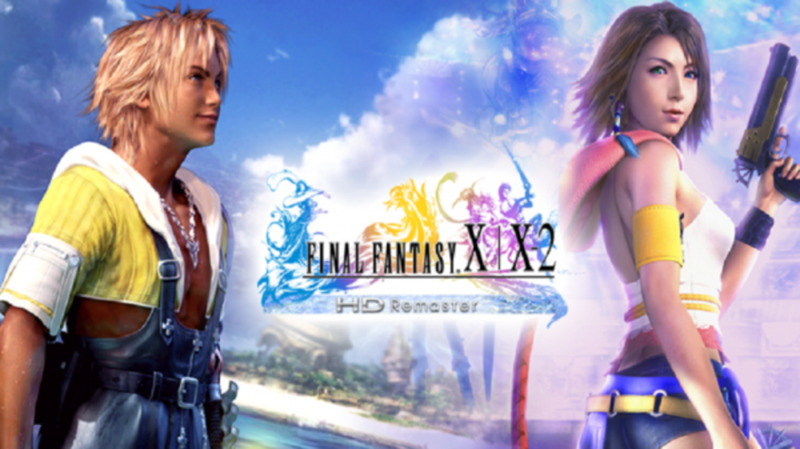 Final Fantasy X is © Square-Enix. This FAQ is here to help you discover every nook and cranny of my favorite game. After collecting four, you go up a rank every time you collect 3 more primers. I'm sorry, I don't speak "Tattooed Buffoon"
Save sphere's on the left, primer's on the right. Luzzu and Gatta, we missed you in X-2! The primer is on the floor in front of the reception desk. Be sure to head to the back and admire the lizard cat, which is Yuna's pet in that great fan-made graphic novel, Guardian! As well as places frequented by the Al Bhed, the primers usually appear near travelers, sailors, and tourist areas, NOT devout Yevonites. The primer is on the floor in the lower right-hand corner of the screen. The Power Room of the ferry is belowdecks, near O'aka. 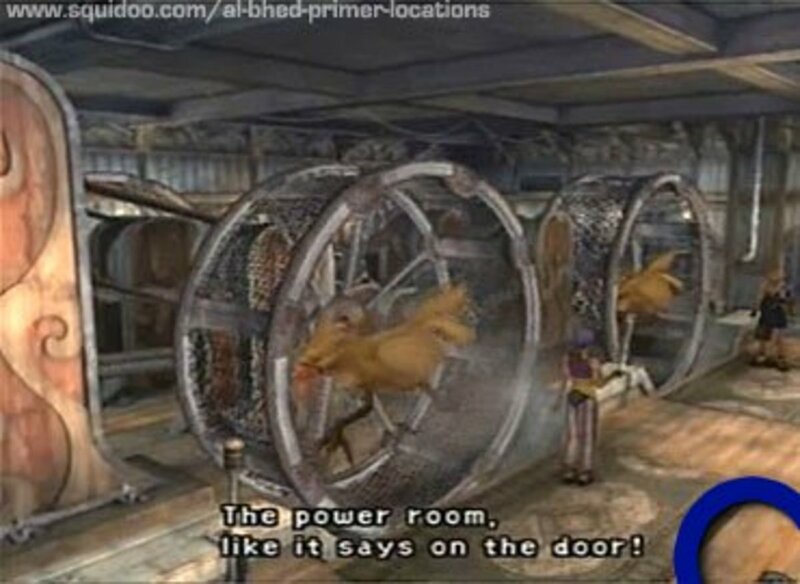 You can only enter the Power Room on your first trip to Kilika. 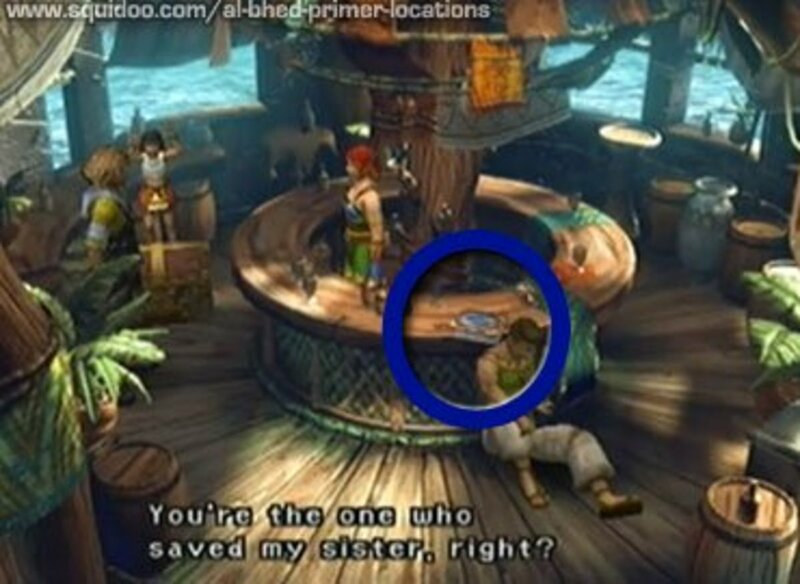 If you miss it, this primer reappears by Wakka's lean-to near the Oasis on Bikanel Island. The primer is on the counter behind the barfly. The pub is the hut at the N end of the dock. It's closed when you first arrive, but open the next morning. The barkeep is Kulukan, a blitzer. Rescue her sister in a broken hut in the nw corner of the village, just before the path heads towards shore, then come back here for a reward. The primer is on the floor behind the helmsman. 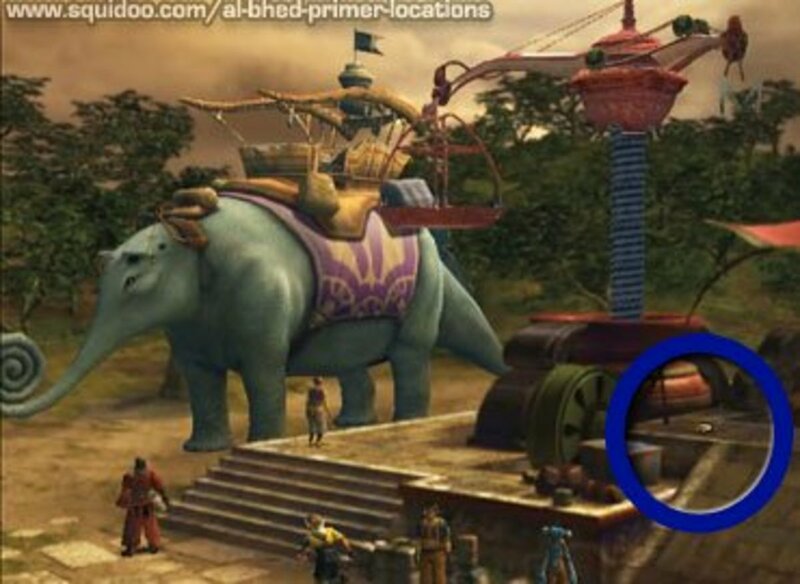 If you miss it, it appears near Kimahri in Sanubian Desert - East. Trivia: When you first board, the Luca Goer women are spying on Keepa in the hold. 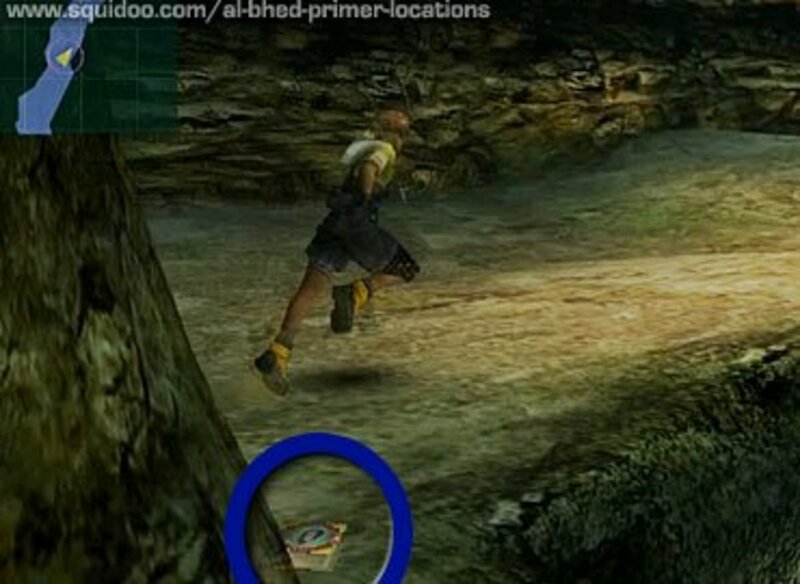 After their teammates taunt Tidus, go back downstairs and you'll find that they've kidnapped Keepa! His buddy Botta isn't much help. 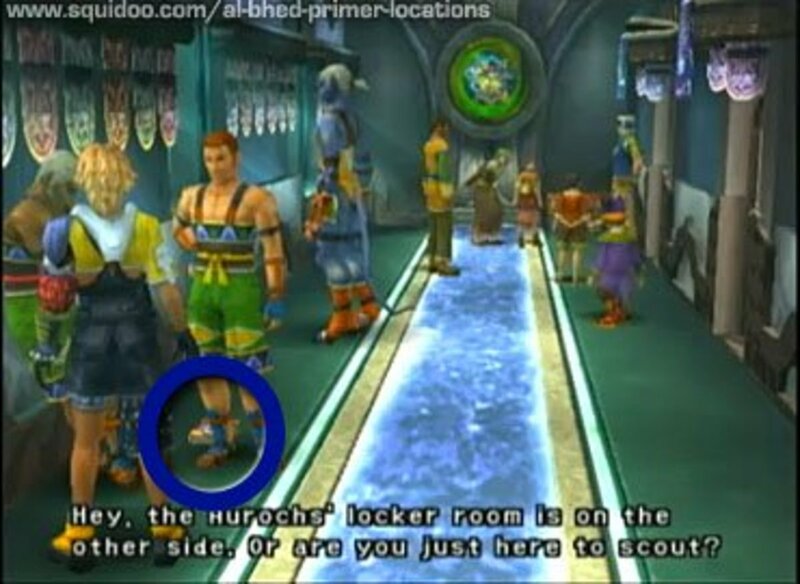 Go to the locker room hallway opposite the Aurochs' locker room, on the LEFT side of the stadium entrance. It's on the floor behind Isken, a Kilika Beast player (addled by Sin's toxin when he first shows up in Kilka). Trivia: Look out the windows at the fishies swimming by! 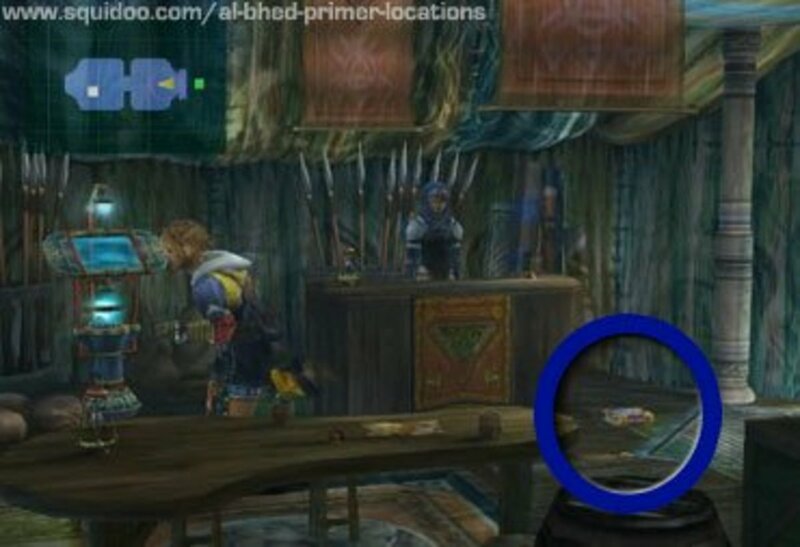 Yes, I'll pay 5000 gil to watch Lulu bawl out poor Wakka again! This one's in Luca Sphere Theater near the reception counter. Trivia: If you revisit Luca after Operation Mi'ihen, it's under martial law. People blame the Crusaders for abandoning Luca during the tournament, and praise the warrior monks who replace them in protecting the city. Very clever, Kinoc. 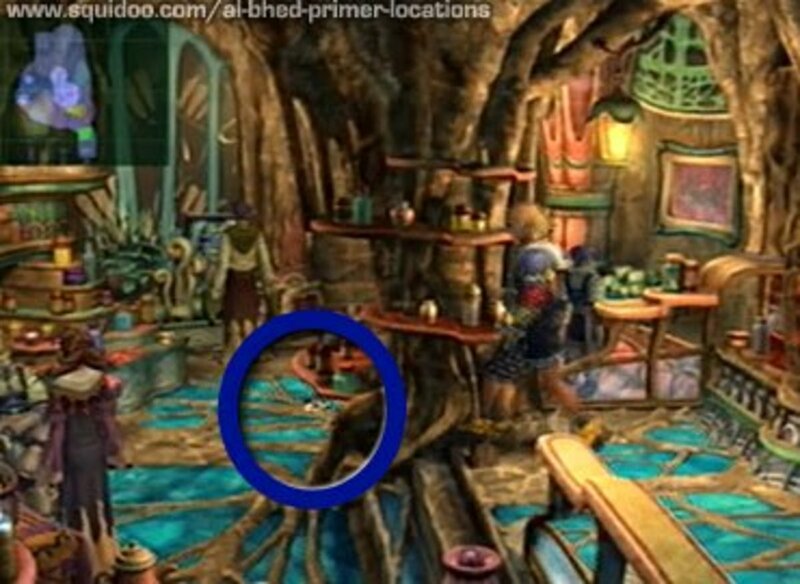 Also, the signs outside this area say "GIL VENTURE" and "AUCTION HOUSE," which makes me think that in the early planning stages of the game, FFX was going to have an ongoing auction like those in Final Fantasy VI and IX. 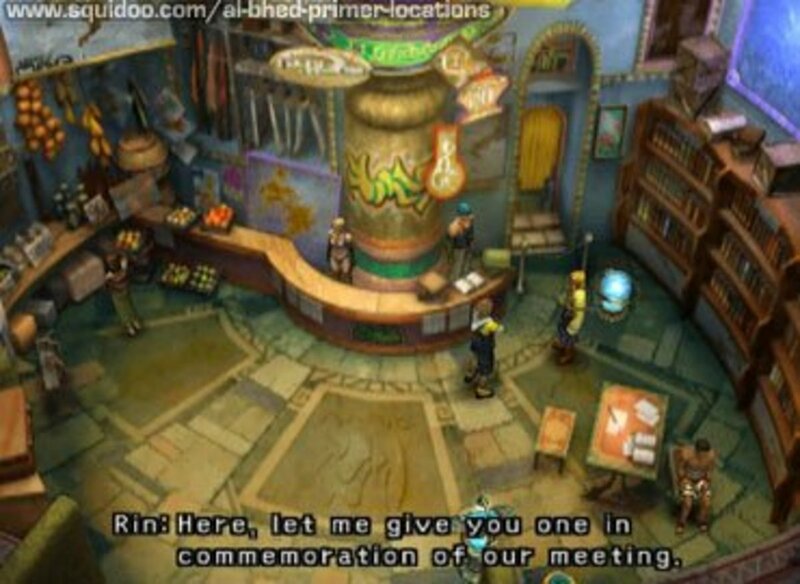 Rin gives you Primer VIII while chatting with you in the Mi'ihen Highroad inn. 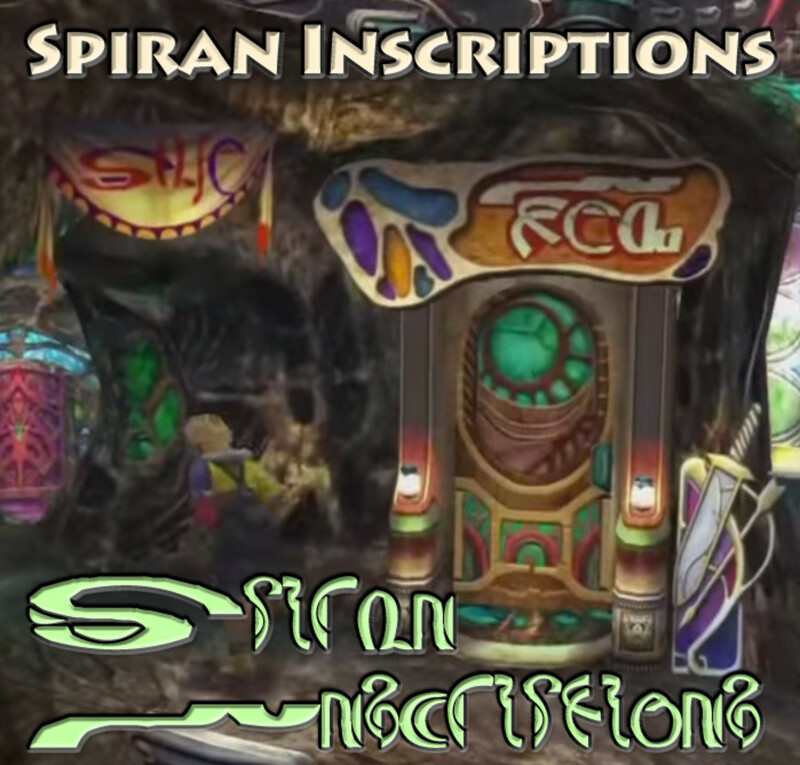 Trivia: There's several maps on display in here, including one at upper left helpfully labeled "Map" in Spiran. 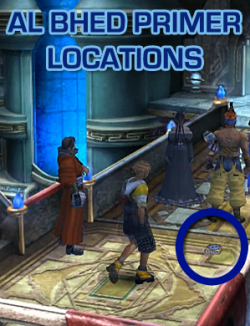 The map above Tidus' head is a close-up of the peninsula from Luca (southern tip) to Djose (NE corner of map). This one's in front of a stone marker (click screencap for better view) on the northern stretch of the Highroad. 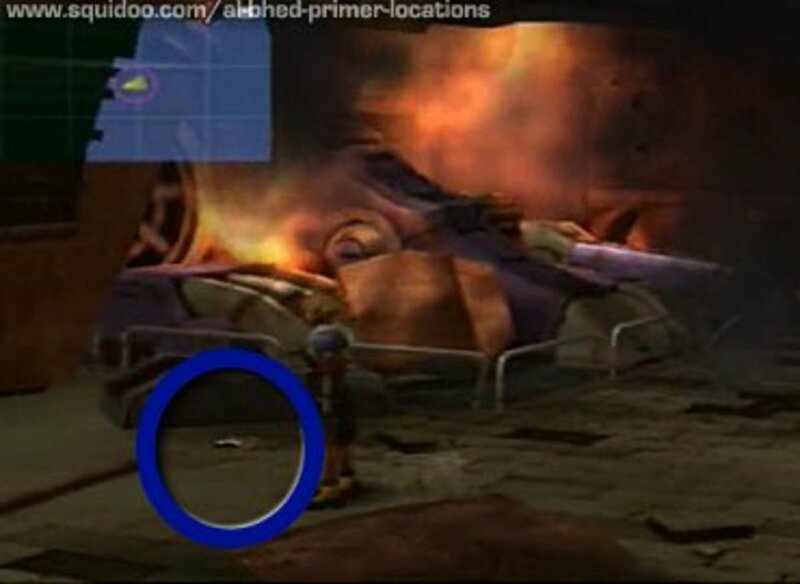 There's a feather on the ground (examine it while riding) off to the left. Trivia: Maechen / O'aka / Mika are voiced by Dwight Schultz: Lt. Broccoli on Star Trek, old Dalan in FFXII; a zillion other roles. Notice the lift-pad on the upper right. This lift goes to where Luzzu and Gatta are arguing. Directions: After taking the lift up from the long winding road, proceed to the next lift, but don't take it yet. Head left to a path circling a stone column. Al Bhed Primer #10 is lying near the end of it. The primer is behind the fourth rocky pillar north of the save sphere. 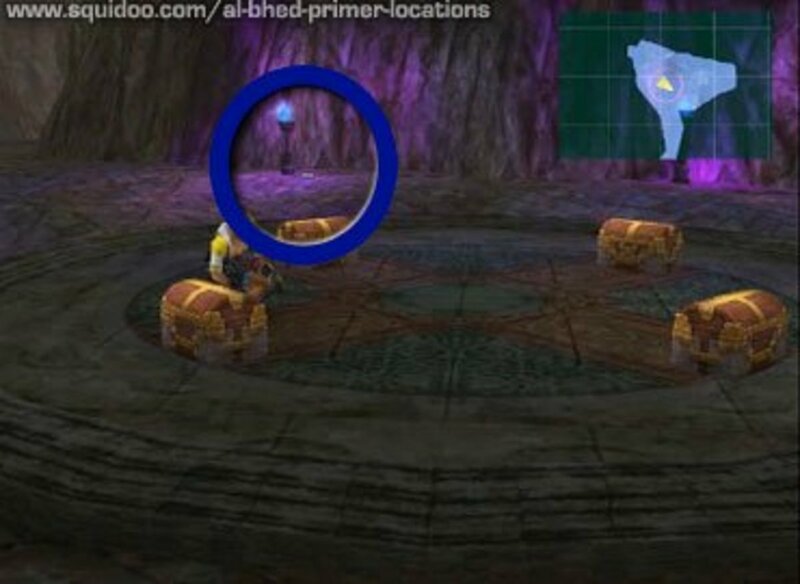 There's a chest on the left just before you reach it. Also, the surviving chocobo knights run past you near here. Listen for the sound of their feet. Finally, an easy one. This primer is on the Shoopuf loading platform after you cross the Moonflow. 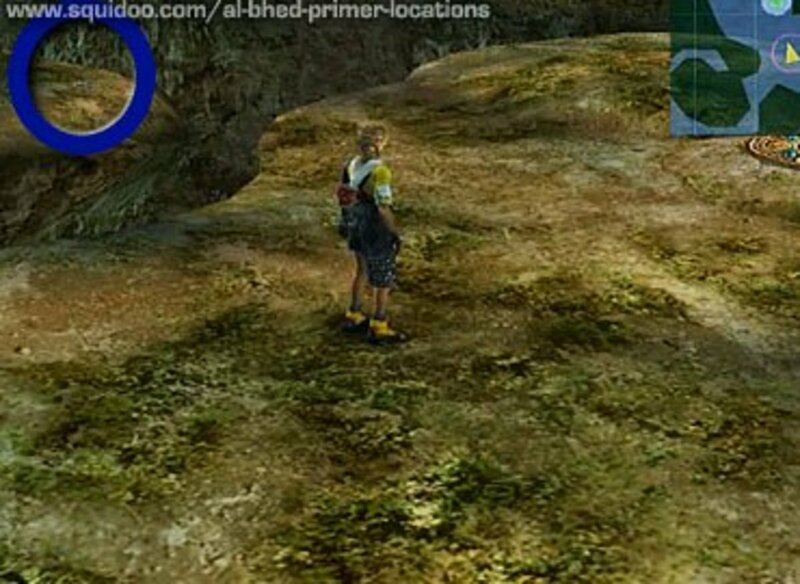 Tip: there's an easy-to-miss chest in the woods on the left just after meeting Rikku. Trivia: One of the few errors in the English subtitles: Maechen's Shoopuf speech misspells "schnoz." #13 is in the house to the left of Seymour's mansion. 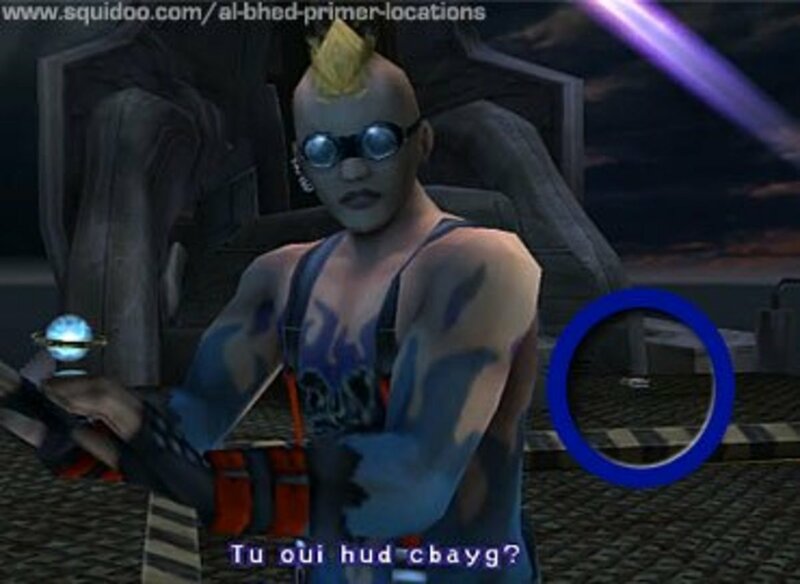 Trivia: After entering Thunder Plains, turn back and go to Farplane to see secret cutscenes with Lulu, O'aka's brother Wantz, and a Crusader family. Return again after Zanarkand and Cavern of Stolen Fayth for two more short secret cutscenes with Tromell and Jyscal, Lulu and Ginnem. Rin, stop trying to blow everybody's cover! Talk to Rikku, then Rin when he enters. 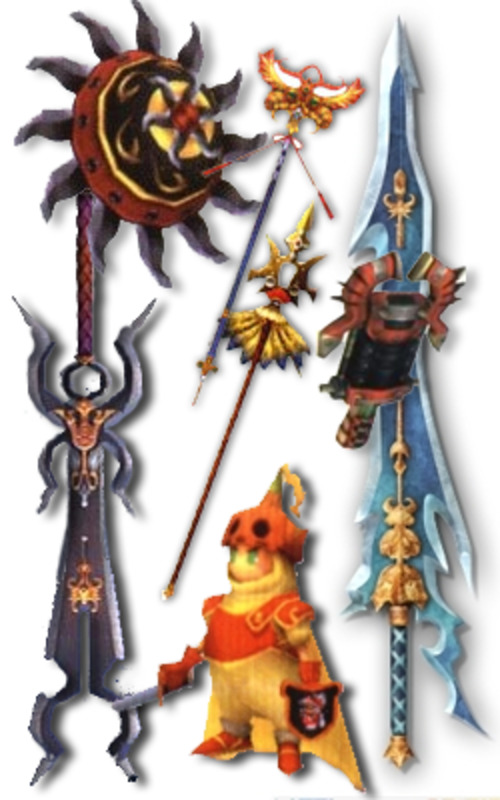 He will give Tidus Primer #14 if you say your studies are going "Okay." Some guides say you must talk to other guardians before Rikku. I'm not sure on that, but talk to Rikku before following Yuna. 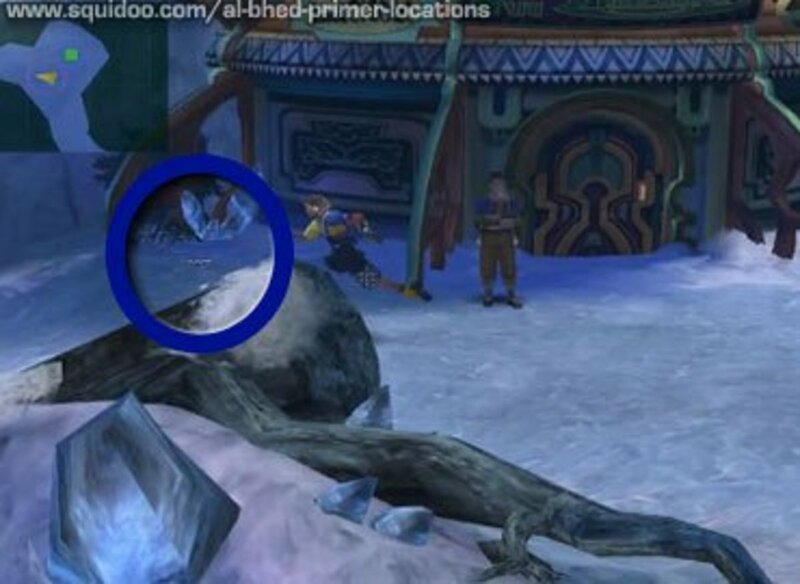 If you miss this primer, it'll be in Sanubia Desert - East, on the left just after you meet Rikku. 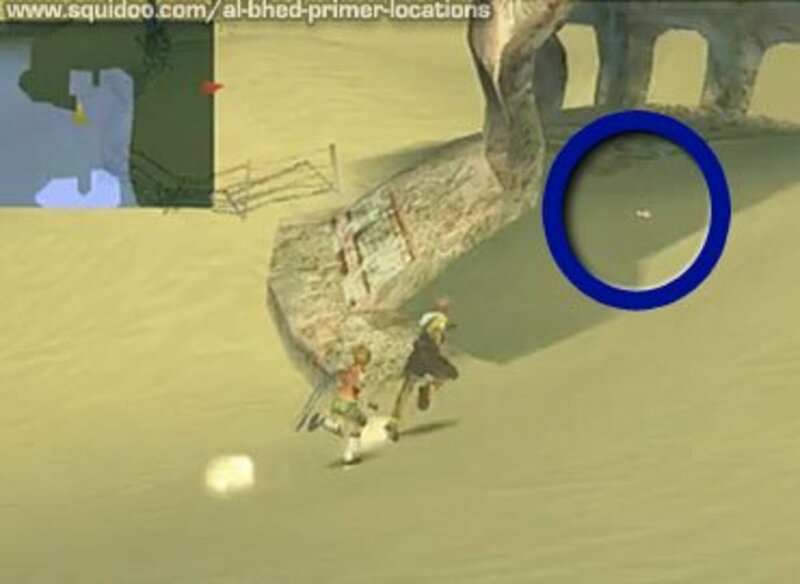 On the north side of Macalania Forest, north of the save sphere, south of the clearing with Jecht's sphere, there's a path heading right that goes up into the sky. At first, the aerial part is blocked. The Al Bhed primer is just before the block. I'm not 100% I've identified the correct blob, but this is about the right spot. Yep, this is the one you'll never find without a walkthrough. But who needs Bradygames Guides when you've got me? This and the last one, foreshadowing that Al Bhed are close by? Primer #16 is easier to see in the game than in this screenshot. It's on the ground in front of the left-hand corner of the Lake Macalania Travel Agency, when facing the front door. Tip: Clasko and his bird eventually move; come back after Bevelle to reach the chest he's blocking. Remember that sign beside a Save Sphere telling you that on the left, there's strong fiends, and weaker ones on the right? Al Bhed Primer XVII is hidden among the "strong" fiends. It's under a ruined dome in the nw part of the Sanubia Desert - Central region. 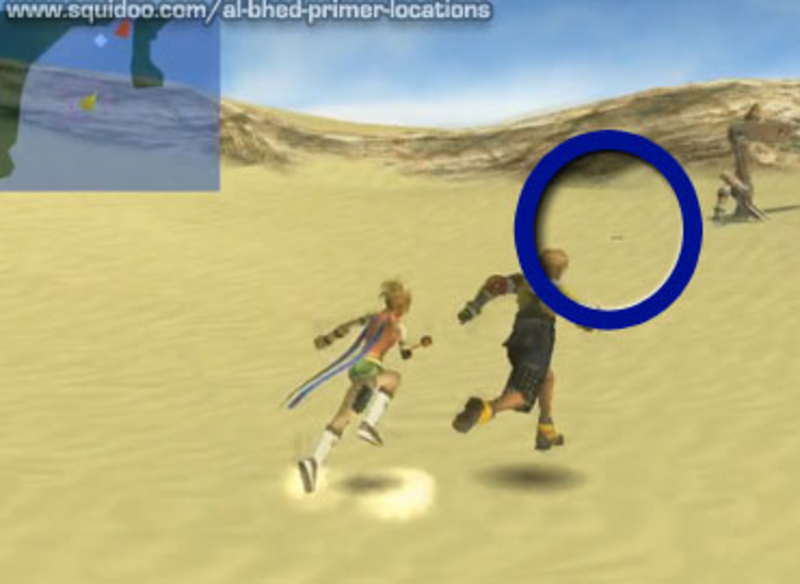 Don't forget one of the great joys of Final Fantasy X: using Auron's Shooting Star overdrive to punt a sand wyrm over the horizon. Al Bhed Primer #18 is to the left of the sign right before you leave the Sanubia Desert - Central area. The sign says, "This way to Home." Trivia: The logo on the the airship and on both Al Bhed vessels reads "Cid" and "Salvage Dream." Warning: Next Four Are "Missible"
You only get one chance to find the THREE primers in the Al Bhed's Home, and ONE primer in the temple of Bevelle. But there IS a way to get them if you missed any! 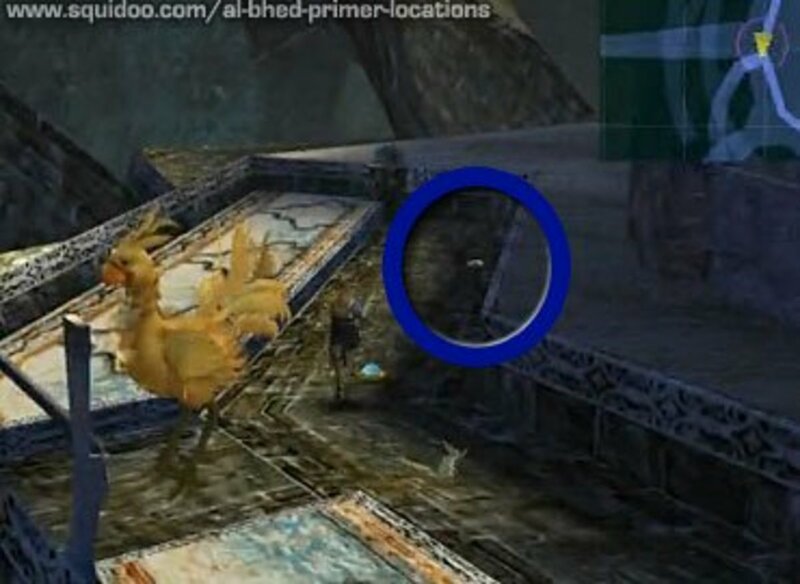 See the Al Bhed Compilation Sphere Tip! Remember, you "can't go Home again"! Here's the first "missible" primer you can't return for later. Al Bhed Primer #19 is next to some burning rubble on the left side of the of the paved area outside the entrance to Home. Do NOT enter without it. Each time you go through a door to a new section of Home, it seals behind you. 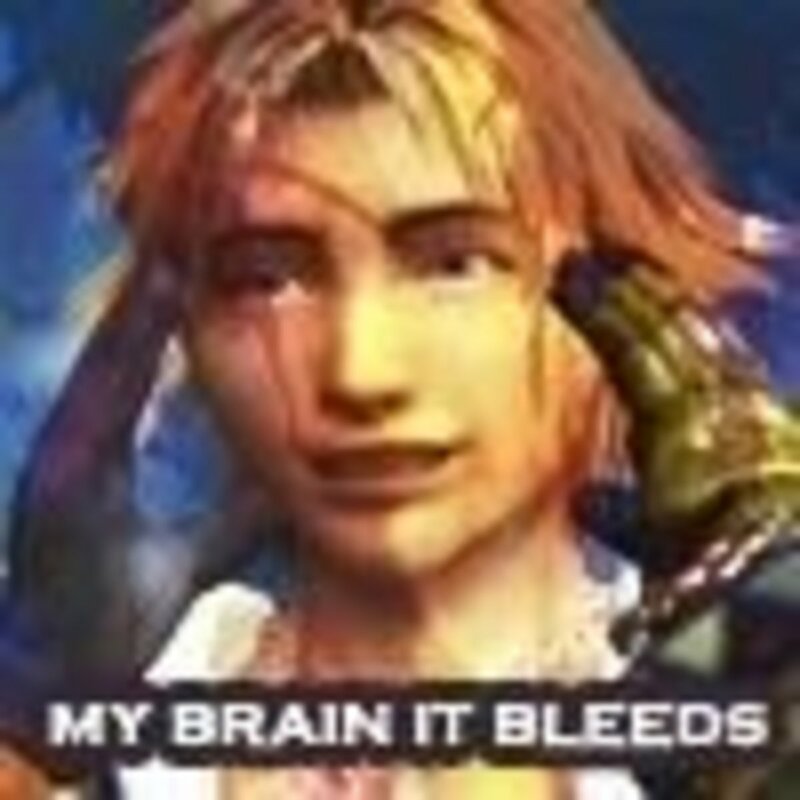 After Rikku says, "The Summoners' Sanctum -- follow me!" there's a battle, then she says, "Over here!" 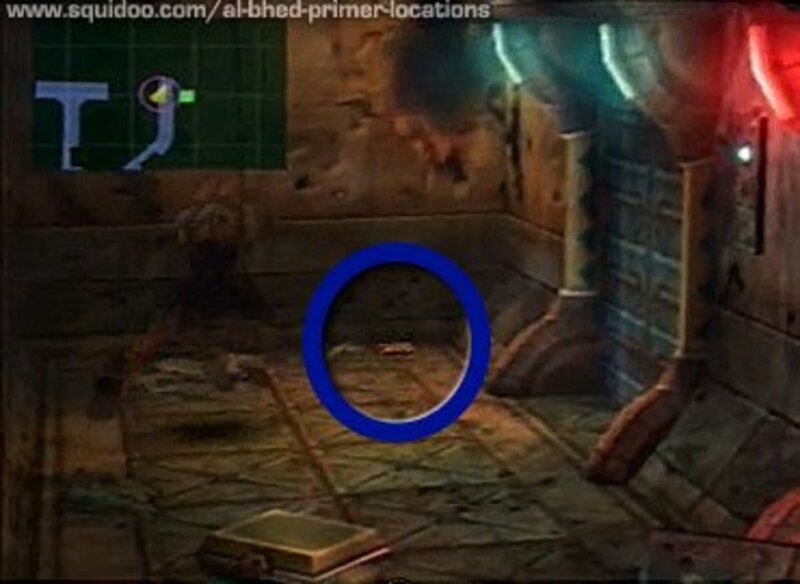 Go down some steps, then backtrack to a door on the left ( green square on minimap). I've brightened the room so you can see the primer, sitting on a bunk under the right-hand corner of some laundry on the ceiling. Head north down steps again. Save at Save sphere on left, but do NOT enter door beside it. Go back to Y intersection and go RIGHT. Primer is on floor outside a room with nasty chimeras. 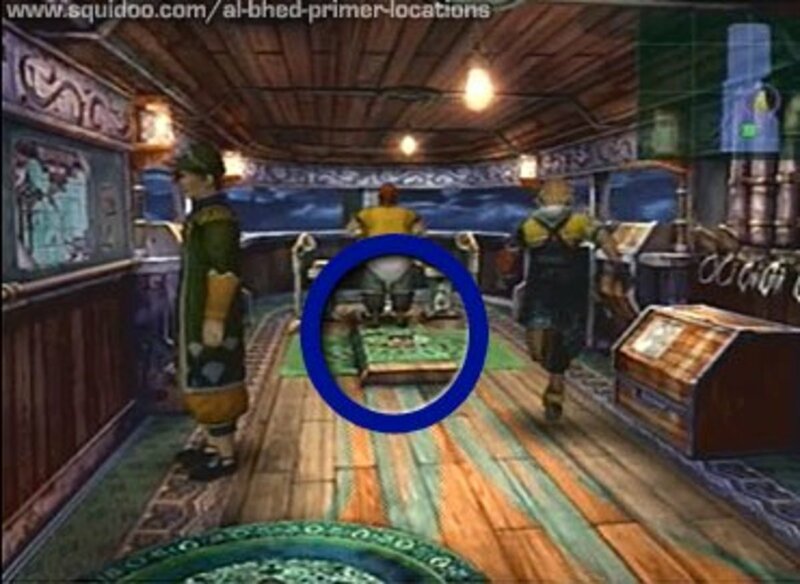 There are TWO puzzle-chests in there, both requiring you to translate Al Bhed. One poses simple math problems; the other asks questions designed to test whether you're Al Bhed. 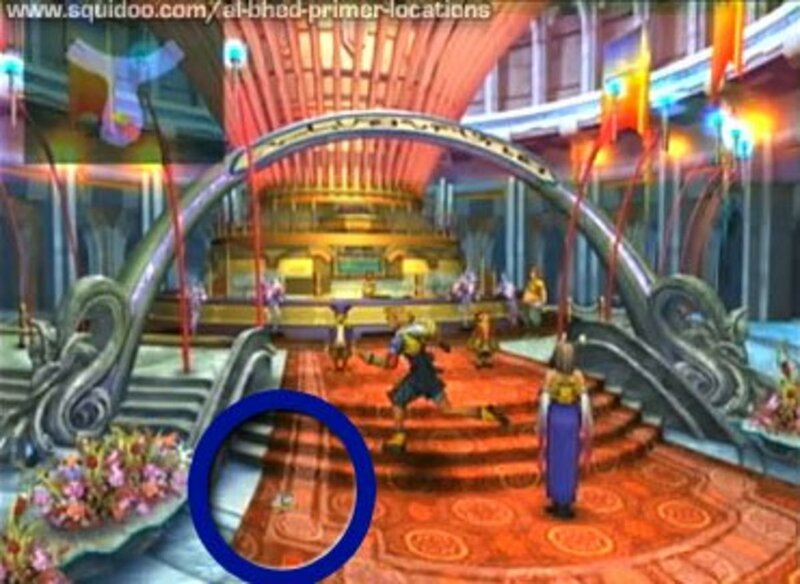 After Yuna's wedding, enter temple. Go down. Note the Save Sphere up ahead. Don't pass it without grabbing primer; you can't return here. Food for thought: why is an Al Bhed primer in the temple? Usually they only show up near Al Bhed or people who travel a lot (sailors, blitzers). You CAN get the Home and Bevelle Primers! 1. Save your current game. 2. Find a saved game file from before Home. 3. Replay and pick up Primers you missed. 5. Save that game. Do NOT replace your current game! 4. In your CURRENT game, go to an Al Bhed Compilation Sphere (easiest: bottom level of Airship). It will add primers from all your other saved game files to your current game! Yay! Easy to see, just way the heck on the northwest corner of the Calm Lands. Trivia: Lady Yocun trained as a Crusader down in the gorge before becoming High Summoner. The primer's on the ground on the left side of Remiem Temple. 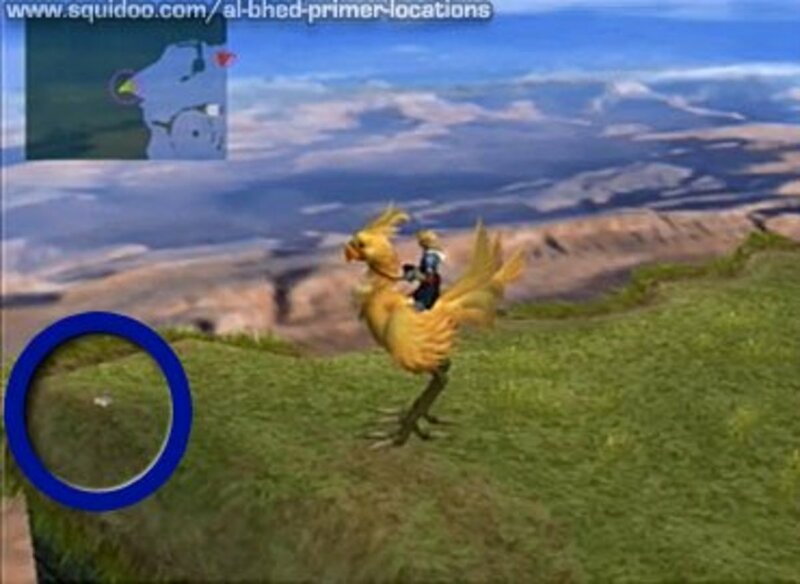 You'll need a chocobo to reach Remiem. The trainer is on the north rim, western side when you first enter Calm Lands; later she's near Calm Lands Agency or the south rim, east side. 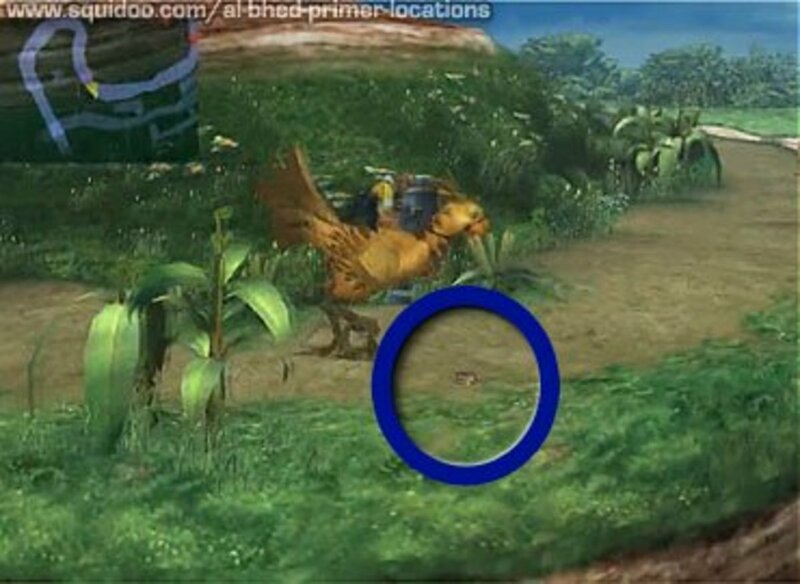 Examine yellow feather in SE Calm Lands while on chocobo to reach Remiem. Go waaay back into the Cavern of the Stolen Fayth. Save at the save sphere. Then backtrack to T intersection and go left to a short dead end. Trivia: When Lulu couldn't stop Yuna from starting summoner training, the novice black mage started going on pilgrimages with other summoners, hoping to defeat Sin and keep Yuna safe. FINALLY! Now return to airship for your Underdog's Secret x99. Beam down to Omega Ruins, prepared for Greater Marlboros. Enter, go left. Passage slopes down, curves to right. Pass small room on left. When you reach glyph at T intersection, go right. Corridor curls around to north, to 4 chests. 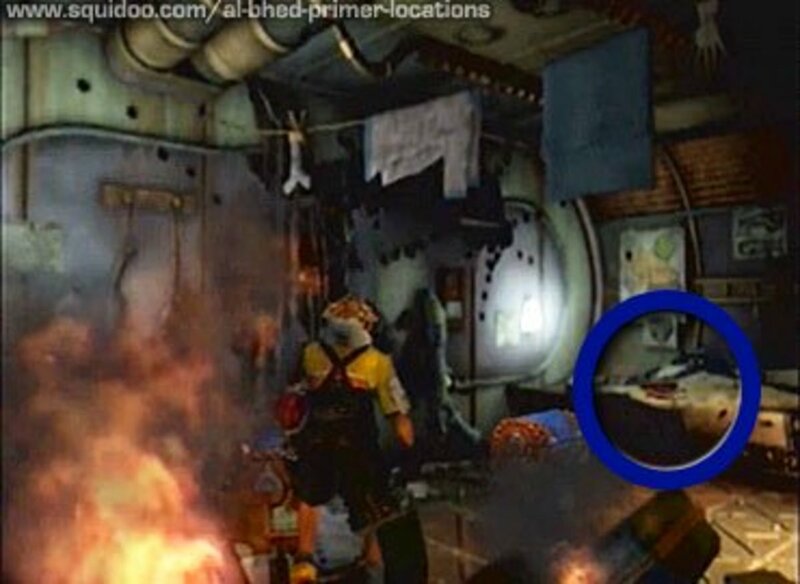 Behind the chests, to the right of the lefthand torch, is Primer 26. 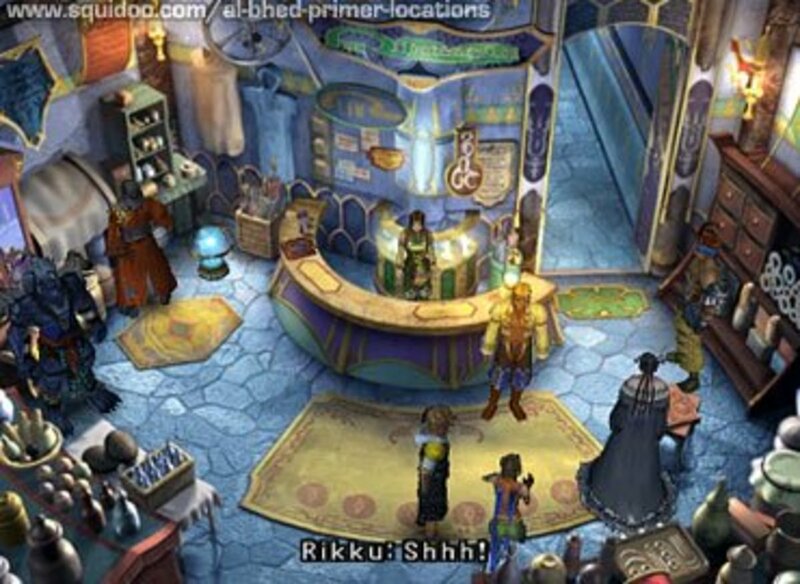 If you talk to Rin on the airship after collecting all Al Bhed Primers, you'll receive Underdog's Secret x99. Use 30 to customize a weapon with Double Overdrive. Use the leftovers for some powerful Mixes. Some wrong information here. You can go back at ANY time to get the primer from the ship, as you can walk into the engine room at any time, too. Awesome! I got hurt knowing that I missed some primers. I looked at other guides and made my head hurt even more. Having these screenshots are heaven-sent! nobody: sorry I didn't see this until now. 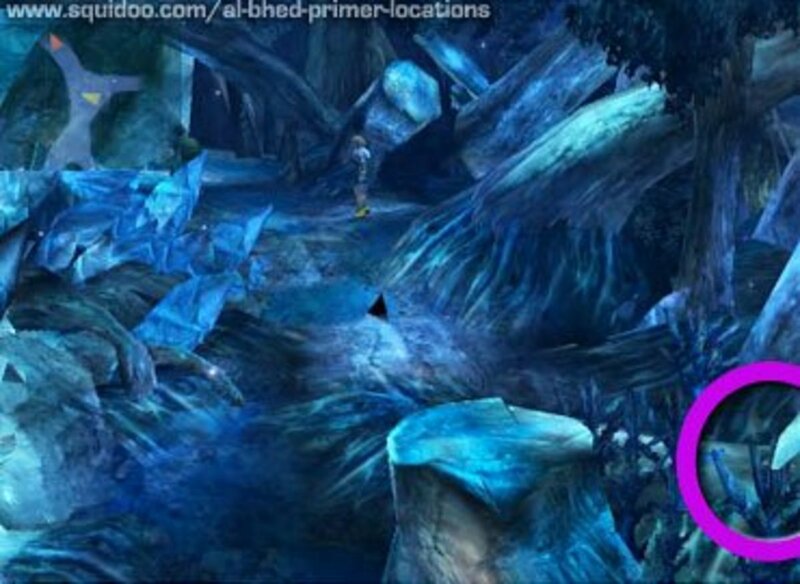 You can go back and get Primer XV after events in Bevelle, if you missed it on your first pass through Macalania forest. If you've got the airship, the closest landing site is (I think?) the Macalania Travel Agency; it's n0t too far to the south of that in the woods. Go to the South Rim of the Calm Lands, south again, then west a room or two and south past a disagreeable sentry until you wind up in Macalania Forest. If the shimmery path into the sky is there, take that -- it's a handy shortcut, and the primer is hidden right before it rejoins the main path on the ground. 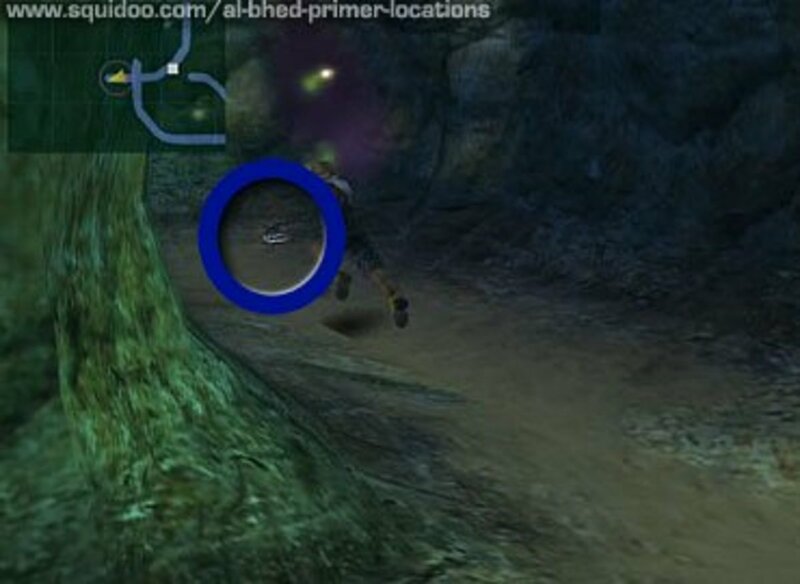 If the shimmery path is NOT there, then grind your way through Macalania Forest on the ground (passing butterflies and such) until you hit another save sphere, and it's just past that in a hidden niche to the right. Dude, this is going to really come in handy. LOVE it. @anonymous: Ack! Yes, let me edit that in. Thanks for the reminder! It's Critically important to mention that, at number 16. 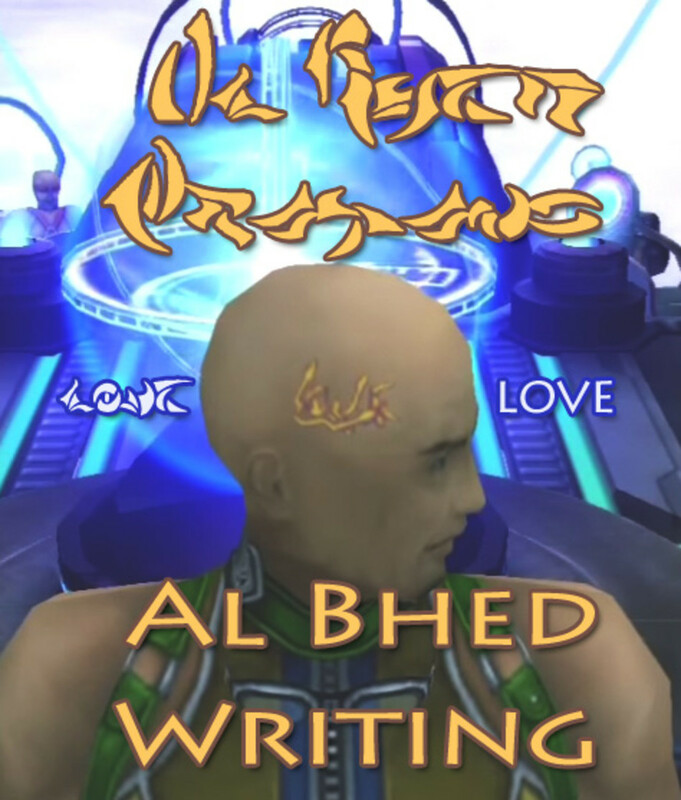 Al Bhed Primer XIV - Thunder Plains Agency, that you must talk to Rikku before you go and burst in on Yuna, otherwise, you will miss it, Like I just did accidentally! @anonymous: Oh, I did NOT know that! According to my traffic stats, we're not the only FFX addicts out there. Believe it or not I'm getting 80 people a week checking out this page. Maybe that tip will help one of them. Thanks! And I just realized, you're probably the Alex who makes all the amazing walkthrough guides on GameFAQs etc! Thank you thank you thank you! Just a little addition, although it's oviously *really* late..